I have been looking for some time for a wall clock for the kitchen. I am quite fussy when it comes to home decorations and refuse to just have things for the sake. Instead I have something in mind and rarely settle until I find what it is I am looking for. Perhaps this is why it has taken so long for me to find a clock for the kitchen. The perfect clock was found recently over on Red Candy. In my opinion at a really reasonable price too, £34.20, and what attracted me to it was how it looked a little different without it being too out there. After all, I want the time piece to feature in the kitchen and so it needs to withstand the test of time too. The Karlsson Origami Wall Clock features a unique origami style texture and it was this that drew me to it in the first place. Available in three colours, white, grey and pink, I went for white as I felt it would match whatever interior I may change the kitchen to in the future. 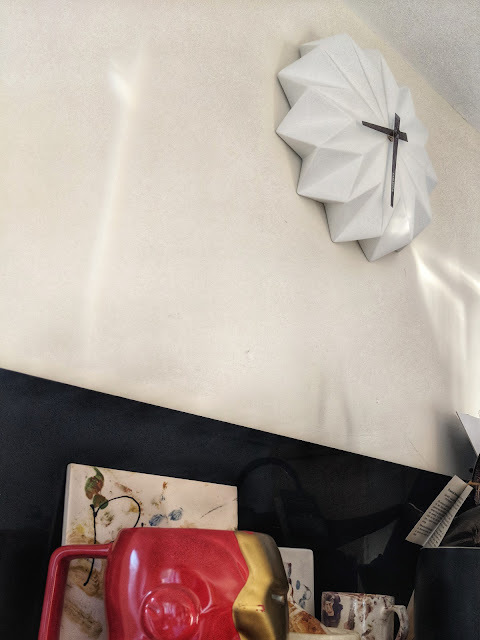 The Origami wall clock sits flush against the wall and almost blends in. The face of the clock then stands out and looks almost as if it has been folded from paper. The clock has a really good weight behind it too and when held it feels exceptional quality. The Karlsson Origami Wall Clock would make a perfect gift for a new home owner or even a Christmas gift, the design is sure to fit in with most home styles. Thanks to red Candy for sending the clock for review, all words are my own opinion.